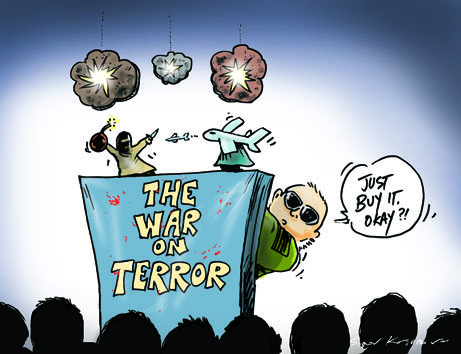 For the inspiration for the cartoon in this month’s issue of New Internationalist see Brian Loffler’s post Hypocrisy, Terrorism and Algeria on the New Internationalist’s Australian blog. Follow his link to Jeremy Keenan’s article How the US has been sponsoring terrorism in the Sahara. While you are on the New Internationalist’s Australian blog have a read of The city can save the planet – much more encouraging!